It is true that two dialects cause a problem when there are so few Armenians in the world. But, having learned some basic facts about Armenian recently, I fear that it will be very difficult to end the division as Avetis Sahagian hopes for. 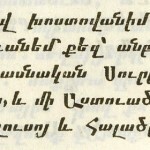 Could the people of the Republic of Armenia return to the classical spelling of Armenian, as some others advocate? Obviously not; a generation has grown up with a phonetic spelling, and they would not willingly switch to an alternative which would require years of effort to learn before they would no longer appear to be illiterate. So Eastern spelling is easier, and the diaspora should shift to it, right? But Western Armenian has pairs of consonant sounds like b/p, d/t, g/k… where Eastern Armenian has three distinct consonant sounds, having unvoiced b, d, and g like Chinese. So a Western Armenian speaker would have to learn to pronounce sounds not found either in Western Armenian or, likely, in the language of the country in which he is living. This is a lot to ask of people who are learning to speak Armenian… to speak to elderly relatives, or to celebrate their heritage… not out of economic necessity, so that success would be imperative. So adding effort to the task would mean fewer people in the diaspora would attempt it. This Story was posted to the «Features» Section. 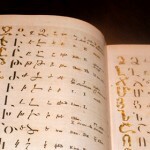 An Armenian translation of a review –commissioned by the journal Codex– of John A. Lane’s book on the history of Armenian printing.